If you have a hunting dog and you hunt from a boat, this is the kind of scene that makes you happy at the end of the day. Waterfowl hunting with dogs on boats can be challenging—every move they make is amplified as the boat moves, they may have trouble getting in and out for retrieves, and it’s never fun to be in such close quarters when they do re-board and decide to shake off. But, as you probably already know, hunting just isn’t as much fun if you leave Fido at home. 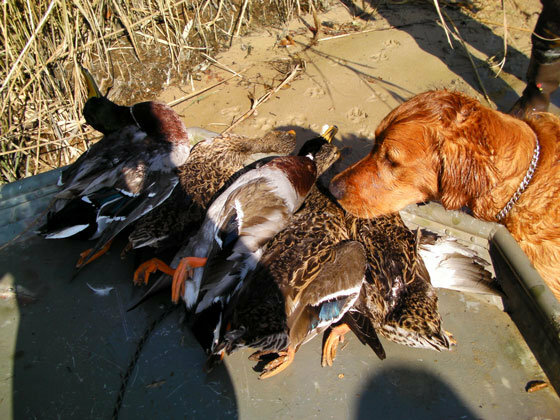 So here are a few tips for hunting with dogs on boats. Tip #1. Give your dog a spot to look from. On a fully-blinded boat, the pooch can’t see a thing. Even the best-trained dogs get jumpy when they can hear the birds, they hear you calling, they see the guns, but they have no idea what’s going on outside the boat. If you make a small hole the dog can look from (and show him where it is) the dog is much more likely to stay put, especially in those final moments when he can feel the tension in the air. Tip #2. If you’re brushed up against land or marsh, allow the dog to deliver the bird outside the boat. I’ve seen guys who insist the dog swim directly back to the boat, and climb in while still holding the bird. I understand the desire to train it to return directly to the boat (especially if you hunt where you may be brushed away from land) but in many cases, this really confuses the dog. He sees the land just a few feet away, and naturally, wants to step out onto it. He won’t have that option, when the land isn’t there. So, why stress over it, if it’s just going to confuse the dog? (Note – I recognize that some will disagree with me on this point, but I hate seeing a confused dog chastised when it clearly doesn’t understand why). Tip #3. When running, don’t leash the dog. A well-trained dog won’t leap from a moving boat anyway, and a leash probably won’t stop a poorly trained dog from giving it a shot. If it’s leashed, however, it could get dragged right into the propeller. Having your dog along doesn’t just improve the hunting experience, it expands it. Take Fido along for that boat ride, and not only will you have a better time, he will, too.